THE SPORTING NEWS, St. Louis, August 17, 1968 This sporting newspaper is about 55 pages in length and is in terrific condition and has never been bound. This particular issue features REGGIE JACKSON & RICK MONDAY OF THE OAKLAND A'S on the front with text about him in the inside pages. 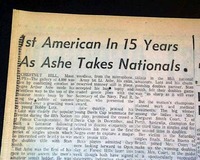 Within the sport's section (page 8) is a three column heading: "1st American In 15 Years As Ashe Takes Nationals". This is 1st report coverage on Arthur Ashe becoming the first African American to win the United States Open Tennis championship.